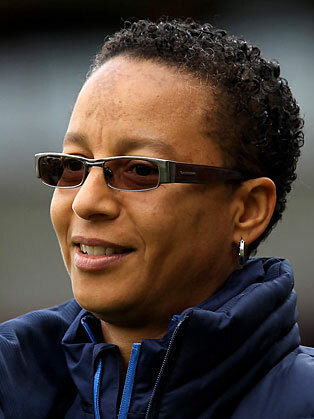 Hope Powell CBE was appointed as the first ever full-time National Coach of the England Women’s team in June 1998. Her first game in charge was a 1-0 defeat to Sweden at Dagenham & Redbridge FC on 26 July. An experienced international with 66 caps and 35 goals, she was the youngest ever England coach and the first female England coach. Hope started out with Millwall Lionesses at the age of eleven and eventually won The FA Women's Cup twice, including the League and Cup double as captain of Croydon in 1996. In 2003 she became the first woman to achieve the UEFA Pro Licence - the highest coaching award available. Her early achievements include taking the U19s to the semi-finals of the 2002 and 2003 UEFA Women’s Championship and to the quarter-final of the inaugural FIFA U19 World Championship in 2002. She also coached the senior team to qualification for the 2001 UEFA European Championship Finals, her first major appearance at a major championship as National Coach, and in June 2005 narrowly failed to take the Three Lions into the semi-final of the European Championship on home soil. In 2002, Hope was awarded an OBE in the Queen’s Birthday Honours list and was again recognised for her work with the award of a CBE in 2010. Hope works to promote the women’s game and is patron of the ‘Kick It Out’ campaign and the Women’s Sports Foundation. As well as taking charge of the England senior team, she oversees the whole set-up from U15s to the U23s, a coach mentoring scheme and she works closely with The FA Centres of Excellence to align to the international programme. In 2006, Hope led England to the following years Women's World Cup Finals in China. After coming out of a group with Japan, Argentina and Germany, England reached the quarter-finals, where they lost out to USA. Hope then masterminded England’s route to the Final of the 2009 European Championship in Finland where they were beaten 6-2 by Germany, catapulting the Three Lions to a then all-time high of eighth in the FIFA Women’s World Rankings. England took this momentum into the 2011 World Cup Qualifying campaign and topped Group 5 with an unbeaten record. This booked them a place in a two legged play-off where they defeated Switzerland 5-2 on aggregate to qualify for the Finals. New Zealand (2-1) and eventual world champions Japan (2-0). Agonisingly, though, they were eliminated by France at the quarter-final stage, losing 4-3 on penalties. Hope then guided England to the Euro 2013 Finals after going unbeaten in the qualifying campaign.